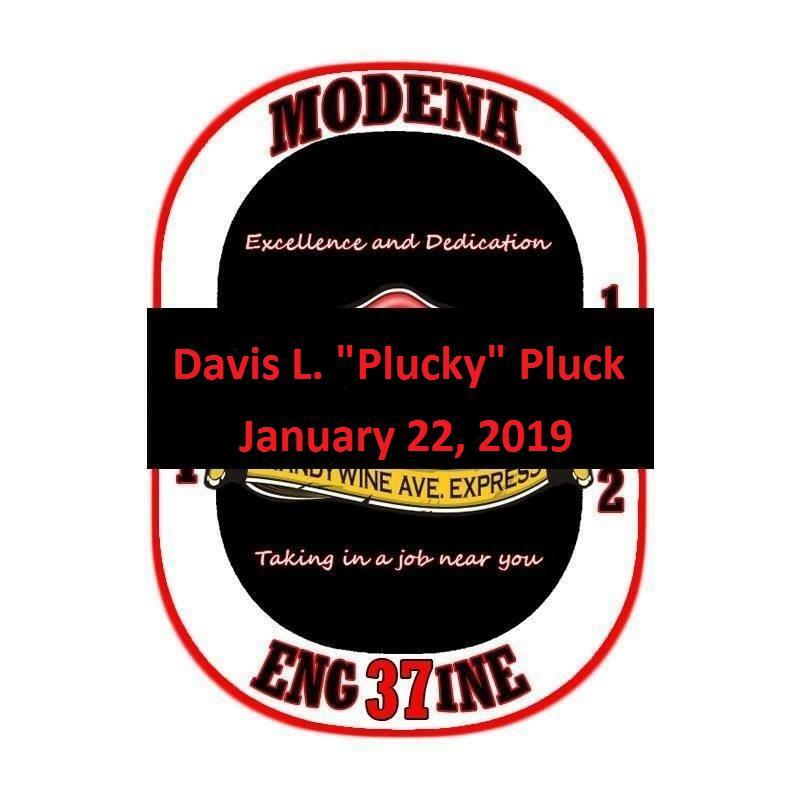 It is with the deepest regrets that the Modena Fire Company announces the passing of Life Member Davis L. Pluck (Plucky). Plucky was a long time member of the company and very active in the 70's and 80's. Davis L. "Plucky" Pluck, 87, of Coatesville, went home to be with the Lord on Tuesday, January 22, 2019 surrounded by his family at Neighborhood Hospice Care in West Chester. He was the beloved husband of Gloria Seiders Pluck with whom he shared 67 years of marriage. Born in Coatesville, he was the son of the late George and Lulu Belle Bussinger Pluck. Plucky was an area resident all his life. He was employed by the Sealed Air Corporation of Modena retiring as a tow motor operator. He also served, for many years, as a caretaker at the Hephzibah Baptist Cemetery. He was a life member of the Modena Fire Company and an active member of the Hephzibah Baptist Church. He is survived, in addition to his wife, by two daughters; Annette Morton and husband Jeffrey of Glenmoore and Dawn Shook and husband Charles of Birdsboro, PA, six grandchildren, 13 great grandchildren and two sisters; Miriam McGinnis of Florida and Shirley Root of Coatesville. He was preceded in death by four brothers and two sisters. Poppop, as called by his grandchildren, always had a smile on his face and love in his heart for his grandkids. The love overflowed to pure joy as his great grandchildren began arriving. He could always been see outside playing with the kids or racing cars across the floor. The great grandchildren loved racing around the pond to see what kind of fish Poppop caught since his second passion was fishing. Funeral services will be held on Saturday, January 26, 2019 at 11:00 AM at the Hepzibah Baptist Church, 2237 Strasburg Rd., East Fallowfield, PA 19320. Family and friends are also invited to attend the viewing at the church from 10:00 AM until 11:00 AM. In lieu of flowers, memorial donations may be made in his memory to the Hephzibah Baptist Church at the above address or City Gate Mission, 17 N 7th Ave., Coatesville, PA 19320. Thank you for honoring my grandfather. He was very proud of his days as a fireman and loved sharing stories. He will be greatly missed by many.